Frank was born at JFK Hospital in Edison, New Jersey, in 1970, to a large extended family strict in the Catholic faith. Faith and family were his foundation. Hunting and fishing became his passion. “My grandfather started a hunting and fishing charter club when I was a kid. He accepted boys and girls.” Frank was hooked. After high school and a stint as an iron worker, Frank’s father helped him pay for a Vo-Tech degree in Building Maintenance Services. “I was a jack of all trades, basically.” He had plenty of work and enjoyed it, but it was tough on his back. When his father was diagnosed with colon cancer, Frank became his caregiver and stayed with him for six and a half years, until he passed. He felt it was his duty to his father. “When I was young and ever got into trouble – either legally or stupid – my dad was always there to bail me out.” After the funeral, Frank left New Jersey. Surgery and convalescence helped loosen Frank’s back, and he began to recover the movement in his legs. If you ask him how he was able to walk again, he says simply, “God’s grace.” But his house had been foreclosed in the process. He had nowhere to live. So, he followed his passion. “After recovering from surgery, losing the house and all that, I just decided to go live up in the mountains out of my truck. I’d been around fishing and hunting all my life, since I was in my diapers.” The next three years passed serenely, but his passion was challenged by his foundation when faith and family drew him out of the mountains and down into Loveland. Frank had been close to the grandson of a lady friend. He had watched the boy grow up from birth and considered him a “spiritual gift.” Frank never married or had kids of his own, but he considered helping care for the child his “spiritual responsibility.” That child was now six years old and lacked a father figure. Frank moved in to fill the void, but living circumstances didn’t work out. So, Frank went back to living outside, in the shadows of downtown Loveland. It began to take its toll. “I got to a point where I wanted to give up on life. I wanted to go to the other side. I started drinking, bad. But it caught up to me.” In November of 2016 Frank had a heart attack, from what he says was “the stress of life.” He knew he had to make some changes. “I started taking better care of myself after the heart attack.” He quit drinking and started focusing on his spiritual gift, who was now 10 years old. When asked what he wished for, Frank says, “I’d like to spend more time with my grandkid,” But he also misses the mountains. “I’m more occupied up there than I am down in this town. I’m an outdoor guy. Hunting and fishing is all I was raised for. 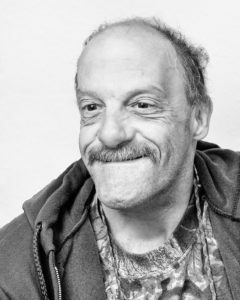 There’s nothing to do when you live on the streets.” But that’s where he’s living for now.